FHWA Home / Safety / Local and Rural Road / Roadway Safety Professional Capacity Building / P2P Technical Assistance / Peer-to-Peer SUCCESS! What is the LRR P2P Program? In order to reduce fatalities and serious injuries on our Nation's road network, local and rural highway practitioners routinely integrate safety into their projects and programs. 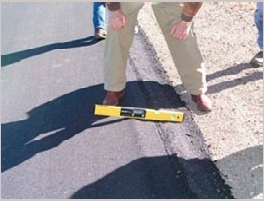 FHWA established the Peer-to-Peer (P2P) Program as a form of technical assistance for local and rural highway agencies to adequately address safety problems on the roads they maintain. 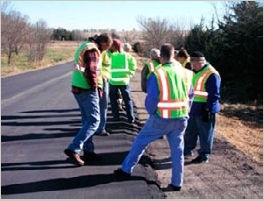 To enhance their local road safety program, the Indiana LTAP Center hired a HELPERS (Hazard Elimination Program for Existing Roads and Streets) Project Manager. While the Project Manager is well versed in local and rural road safety, certain aspects of the LTAP environment were new. Discussions between the Indiana FHWA Division Office, Indiana DOT and the Indiana LTAP Center led to contacting the Local and Rural Roads Safety Peer-to-Peer (LRR P2P) Program for training assistance. It was decided that the training would take the form of shadowing local and rural road safety practitioners from other State LTAP Centers. The LRR P2P Coordinator worked with the Project Manager to identify appropriate LTAP Centers and coordinated with Iowa and Louisiana to set up visits. All necessary travel arrangements were made by the LRR P2P Coordinator who also facilitated pre-visit discussions. Identifying possible high hazard areas. Conducting road safety audits (RSAs). Systematic improvements, national resources, and program development. Project development, relationships, and communications. Creating advisory groups to discuss ideas for the future of the HELPERS program. Armed with the knowledge from two LTAP site visits, the HELPERS Project Manager returned to the Indiana LTAP to share this information with her coworkers and apply it to the day-to-day activities of the Center. Plans include increased efforts to reach out to local agencies, law enforcement, and communities to educate and actively involve these organizations in local and rural road safety. Other specific actions that the Project Manager will take as a result of the visits include establishing a systemic approach to increasing roadway safety by addressing intersections and curves with standard packages of improvements, promoting use of the Safety EdgeSM to local agencies in Indiana, and keeping track of best practices for inclusion on the Indiana LTAP website.